As dawn broke on May 27th the two opposing armies stood where they had at the end of the previous day. For the Union, the Brigadier General John Newton’s 2nd Division of the Fourth Corps connected with the Twentieth Corps to the west. Brigadier General Thomas J. Wood’s 3rd Division was on Newton’s left, and Major General David S. Stanley’s 1st Division was behind them in reserve. The two divisions of the Twenty-Third Corps, Army of the Ohio, extended the line to the east. Major General Jacob D. Cox’s 3rd Division linked up with Wood’s Division, and Brigadier General Milo S. Hascall’s 2nd Division was posted on the army’s far left flank. The Twenty-Third Corps bent back to the north to protect their exposed flank. Finally, Brigadier General Richard W. Johnson’s 1st Division of the Fourteenth Corps lay in reserve around Brown’s Mill. The exact location of the division is unknown, one brigade commander’s official report merely stating at Brown’s Mill. In the Confederate lines, Major General Alexander P. Stewart’s Division of Hood’s Corps held New Hope Church. Major General Carter L. Stevenson’s Division held the center of the corps line, and Major General Thomas C. Hindman’s Division formed the right of corps. Major General Patrick R. Cleburne’s Division held the extreme right of the army. 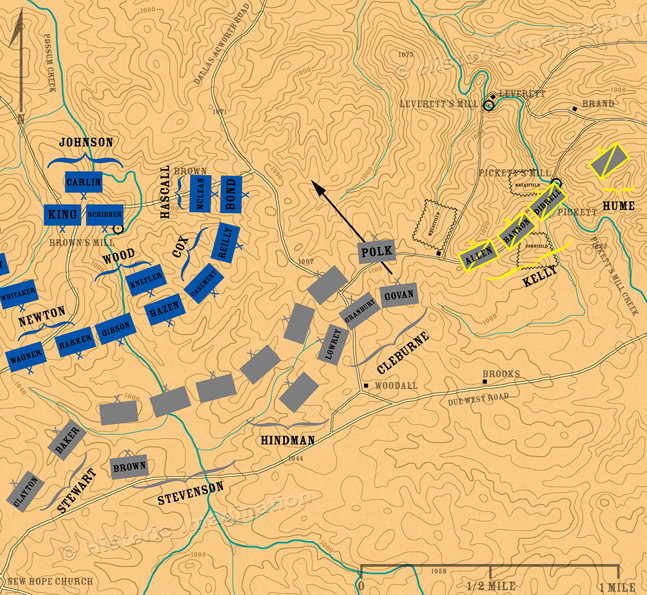 One brigade was on the line, and the remaining three were in reserve behind his and Hindman’s divisions. Beyond Cleburne the cavalry divisions of Brigadier Generals John H. Kelly and William Y. C. Hume picketed the flank of the army with skirmishers. At about 7:00 AM, General Cleburne ordered Brigadier General Daniel C. Govan to take his brigade beyond the lines and actively reconnoiter the area in front of the army and report any movement by the enemy.